A mixed farming enterprise has allowed the Colegrave family to supply customers with a range of products. Danusia Osiowy visits Banbury to find out how the business has evolved. With a late start to the season, asparagus picking is still in full flow during a tour of Wykham Park Farm, Oxfordshire. It is a slick operation, as a team of 16 seasonal workers hand-picks the crop before driving it back to the packing room, where the produce is washed and graded ready to be sold. Although known locally as The Asparagus Farm, the Colegrave family is very much a busy, mixed farming business, combining livestock production with 364 hectares (900 acres) of arable cropping, permanent grass and woodland. John, who took over from his grandfather, who bought the farm in the 1930s, runs the farm with wife Julia and daughter Lizzie. Having supplied the multiples with combinable crops for many years, the family also previously sold some of its seasonal produce via an honesty box on-farm. But it was the by-product of a hobby in 1991 which really created a new kind of business model, as Lizzie explains. “My mum has always enjoyed growing vegetables, so when she decided to have a go at asparagus it was new to us all,” she says. “Nobody knew much about how to grow it, but she had a go and planted two acres. “It took two years until she was able to pick the first crop and we began selling it from our garage along with bags of potatoes, onions, courgettes and sweetcorn we also grew commercially on-farm. It was the start of some big changes.” Although the farm traditionally supplies commercial outlets with its beef and crops, the family also realised the local demand for their produce was growing. Responding to this, the family began supplying beef boxes with their Aberdeen-Angus cross suckler cows, but became aware of Longhorns. “Going into Longhorns allowed us to tell a story to customers, rather than just being a farm that buys-in to fatten up cows and sell to wholesalers and the multiples,” says John. “We bought 10 cows from the East coast of England, as a dealer knew of a clearance sale and we decided to breed our own. “We really got on with them. They are very low input, docile, easy calvers and have a good temperament. Still operating very much as a commercial business, the move also saw the family begin to attend farmers’ markets and create a new market for their produce. In 2000, thanks to the popularity of their asparagus, seasonal produce and native beef, the family converted an old shed and opened a farm shop just as footand-mouth hit. Lizzie says: “We had always traded as cattle dealers, but when foot-and-mouth hit we had just opened the shop and selling at farmers’ markets. “Fortunately we weren’t in the mix and customers did still call in. They would ring the bell and our butcher would run down to them, take their order and run back up. With a clear focus on homegrown produce, the butchery is almost 100 per cent self-sufficient in beef and lamb. John says: “We started selling beef boxes which had a little bit of everything with our AberdeenAngus cross suckler cows. “But then we realised people didn’t want a beef box, as some preferred fillet steaks, others mince and some roasting joints. Although farmers’ markets once featured heavily in their retail plans, operating at four a week at peak times, John and Julia eventually stepped away in 2006, once the shop was established. “Farmers’ markets were very important to us at that time,” says John. “If we didn’t have what they wanted at the market, we were able to tell them about the shop. We carried customers over from one outlet to another. 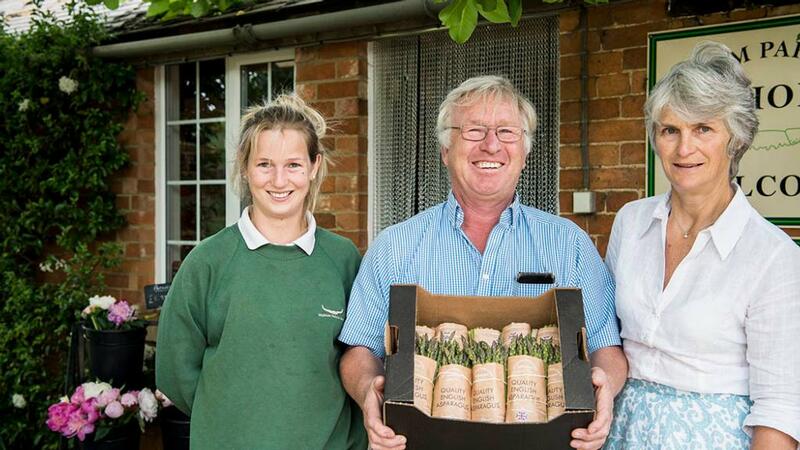 Core to the farm business is the asparagus, which now extends to 28ha (70 acres) and is supplied through the shop, wholesale and 80 per cent to the multiples via West Growers, Pershore. Growing asparagus is a labour of love for the family. F1 hybrid A crowns are bought-in from Holland and are already a year old when they are sown into soils. John says: “Asparagus likes free draining soil. We have a naturally high mineral content from the ironstone present on the farm, which I believe gives it more flavour. Four different varieties are used – Gynlim, Backlim, Millenium and Tallems – which offer different characteristics. 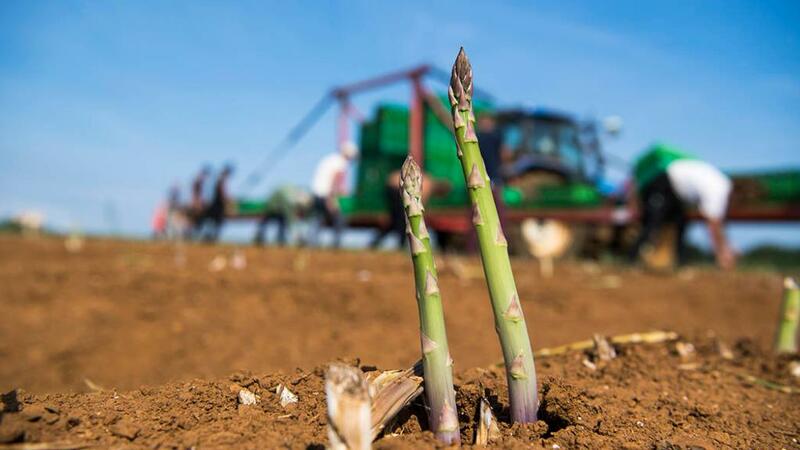 With asparagus not being a particularly hungry crop, a minimum amount of fertiliser and nitrogen is applied, using one application at 100 units per acre. Lime is applied to keep a soil pH of 7.5, the optimum for asparagus to grow in. John says: “Its biggest enemy is weeds, the worst being perennials such as thistles and nettles. With a lot of pesticide withdrawal legislation, we are very reliant on residual herbicides. “Once they are grown, you have to clear pick it. Then we cultivate the beds and apply a herbicide and glyphosate. “We hope a cocktail of different kinds will help kill them off, especially important when the asparagus grows to fern.” Weather dependant, picking begins on April 20, although it was slightly later this year on May 4. A group of 16 seasonal workers hand-picks the crop, which yields about 3t/ha (1.25t/acre). “Labour is our biggest challenge. Seasonal workers are vital and we hire eastern Europeans through an agency,” John says. “While we pay more than the national minimum wage, it’s still unbelievably hard work and has to be completed in all weathers. “Because of Brexit, the pound devalued, so foreign workers then take a 15 per cent pay hit. “It’s an uphill battle to get seasonal workers to commit, especially when they can go into factories and earn twice as much. Looking to the future, the 30-head Longhorn cows will continue to run separately from the 350-strong commercial herd. 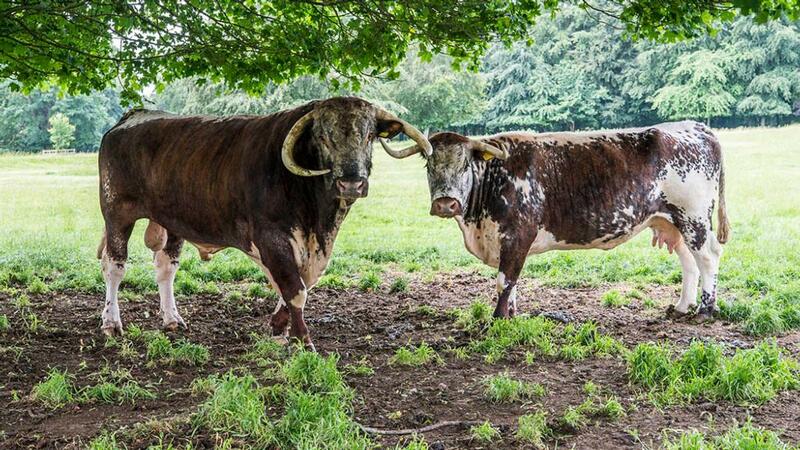 Predominantly grass-fed, the Longhorns are grown to 36 months and supplied solely into the shop while the commercial herd is sold deadweight to Foyles under its Angus scheme. More recently, pedigree South Devons have been introduced and will be put to their own Salers to produce good replacement heifers. “We had problems with lameness in the British Blue crosses as the cows were lame and it was a real job sourcing good breeding stock,” John says. With a footfall of about 1,200 customers each week, the shop is now a key player to the business. Interestingly, it is a modest size and is located in the middle of a working farm. It’s one of the reasons the family has refrained from adding a coffee shop, at least for now. “We remain a truly mixed working farm,” says Lizzie. 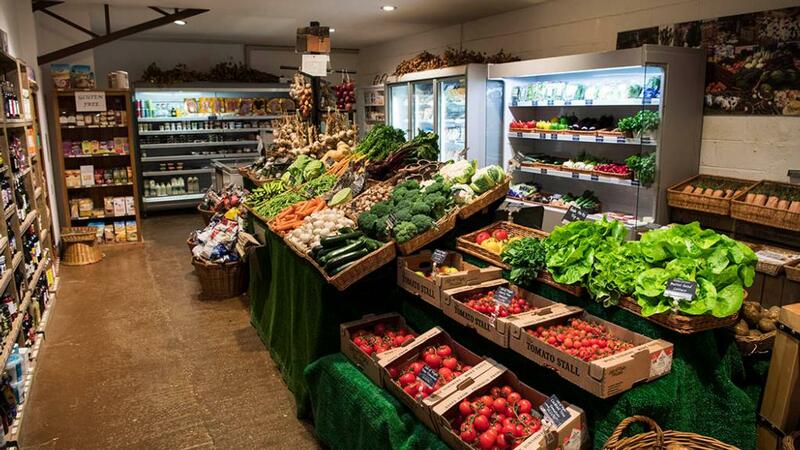 “The farm shop buys the produce from the farm and that’s why the farm shop has helped the farm evolve, as we understand what our customers want to buy. It’s one of the reasons we don’t really grow brassicas, because you buy them easily from the supermarket. “We opt for more unusual produce, such as coloured beetroot, rhubarb, spinach and fennel so that we can place a slightly higher margin on them.